- the son of the god Zeus and Alcmene. - noted in mythology for mainly for his strength and courage. - He had twelve major tasks through his lifetime that would bring him great fame. The first was to kill the lion of Nemea. 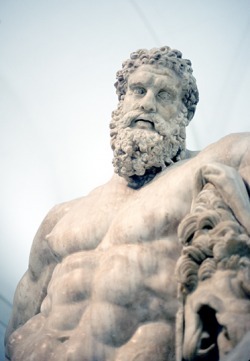 It could not be wounded by any weapon, but Hercules sunned it with his club and strangled it to death. The second task was to kill the nine-headed hydra that lived in the swamp of Lerna. He burned the mortal necks of the Hydra to prevent reproduction and poisoned it with arrows to finally defeat it. The third and fourth task was to capture alive a stag with golden horns and bronze hoofs for Artemis(who was similar to Roman Diana), Greek goddess of the hunt and to capture a great boar that lived on Mount Erimanthos. - There are more tasks that he accomplished, all using courage strength, and wit. Source: "Hercules." MSN Encarta. Microsoft. 20 May 2008 <http://encarta.msn.com/encyclopedia_761570023/Hercules_(mythology).html>.